Today was an impromptu eat-out-food-day. It started with a vegan popsicle in the French Quarter at a place called Meltdown–it was strawberry cardamom flavored. It was a little lacking in cardamom flavor, but it was still great nonetheless. The aim of the afternoon was to go see the Naval ships (it’s fleet week), but after standing in line for a half hour in the hot sun and going nowhere, we decided to get out of line and go find a beer. We went to some bar (I don’t even know which one) but they had $1 tacos, which were somewhat reminiscent of taco days in the middle school cafeteria–you know with the slightly stale shell? 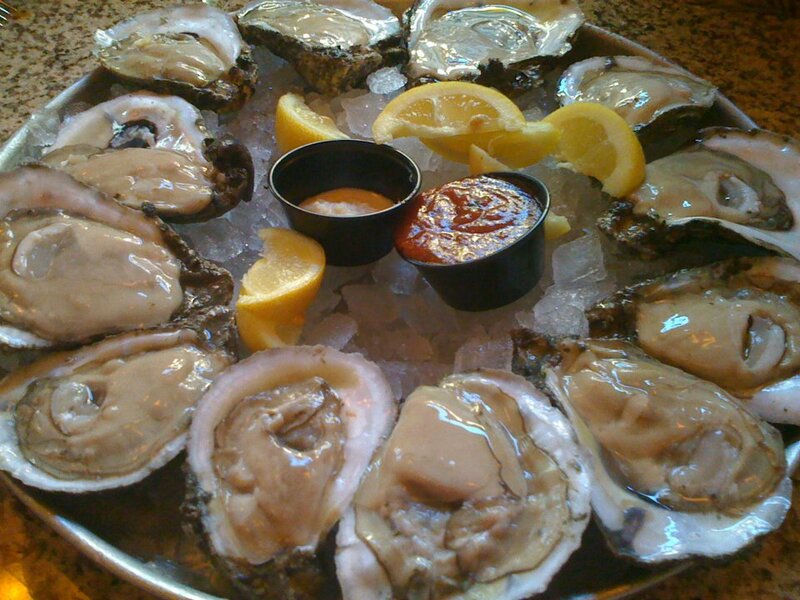 Then one of our friends had a craving for raw oysters, and after a bit of prompting, and an offer to pay for them, we made our way to Bourbon House. I’ve probably passed by this place a dozen times walking down Bourbon street after midnight, but I never noticed it. It definitely looked different during the day. Anyway, we got a dozen raw oysters, and I got to have my first real raw oyster experience, with lemon juice, horseradish and/or cocktail sauce, and tabasco sauce—-*ssssslurrrppp* They were definitely on point. I thought the texture would bother me but I could go for another dozen as we speak. We washed it down with bourbon milk punch, which was the best new drink that I have tried in a while. I will promptly be making a pitcher of it in the upcoming weeks. Overall, I’d say that whatever kind of an ‘eh’ day I was having earlier was definitely bettered by eating great food in the presence of great company. Between today’s food excursions and yesterday’s (BBQ at the Joint in the Bywater–a MUST), I feel a new trend of food dates in my future at as many places as I can get to–and that are in my broke grad student budget.